Singapore, 1 April 2019 – The dry phase of the Northeast Monsoon that has prevailed over the surrounding region since late January 2019 has ended with the onset of inter-monsoon conditions in end March 2019. The prevailing winds in the region are forecast to become light and variable in direction and are expected to persist through May 2019. 2 During the inter-monsoon period, the monsoon rain band lies near the equatorial region and more showers can be expected over Singapore and the surrounding region. Climatologically, April is the second warmest month of the year, with high lightning activity. 3 Compared to the last fortnight of March 2019, more rain days are expected in the first fortnight of April 2019. During this period, short-duration thundery showers are expected in the afternoon on six to eight days, and could last into the evening on some of these days. In addition, on two or three days in the fortnight, the eastward passage of Sumatra squalls from Sumatra or the Strait of Malacca could bring widespread thundery showers accompanied with gusty winds over Singapore in the morning. Overall, the rainfall for the first fortnight of April 2019 is likely to be near-normal. 4 Despite more rain days expected in the first half of April 2019, warm conditions are still expected to prevail. The daily maximum temperature could soar to over 35°C on a few days, and the daily temperature is expected to range between 25°C and 34°C on most days. The strong daytime heating of land areas coupled with convergence of winds over Singapore and the surrounding vicinity are conducive for the development of thunderstorm clouds in the afternoon. 6 In March 2019, the dry phase of the Northeast Monsoon prevailed over Singapore and the surrounding region, and the low level winds blew from the northwest or northeast. 7 Singapore experienced drier and warmer than usual conditions in March 2019. This was partly due to the presence of a dry air mass that extended from the Pacific Ocean to parts of Southeast Asia. In the last week of March 2019, the influence of the dry air mass weakened and the monsoon rain band shifted northward closer to Singapore and the surrounding equatorial region. This brought short-duration thundery showers over Singapore in the late afternoon on several days. The daily total rainfall of 94.6mm and 91.7mm from the intense thunderstorms that fell over many areas in the afternoon of 11 March and 21 March 2019 respectively were the highest daily total rainfall recorded in March 2019. 8 In March 2019, the highest daily maximum temperature recorded across the island was at least 35°C on 19 days of the month. The month’s highest daily maximum temperature of 35.9°C was recorded at Choa Chu Kang on 23 March 2019. At the climate station in Changi, the average temperature for March 2019 was 28.7°C. This ranks March 2019 as the third warmest March in Singapore (since temperature records began in 1929) after 2016 and 1998 (both strong El Niño years) with monthly average temperatures of 29°C and 29.5°C respectively. March 2019, together with February 2019, January 2019 and December 2018, are the warmest respective months in the last 90 years that are not influenced by the El Niño. With an average temperature of 28.1°C, the just concluded Northeast Monsoon season (December 2018 – March 2019) is the third warmest on record. 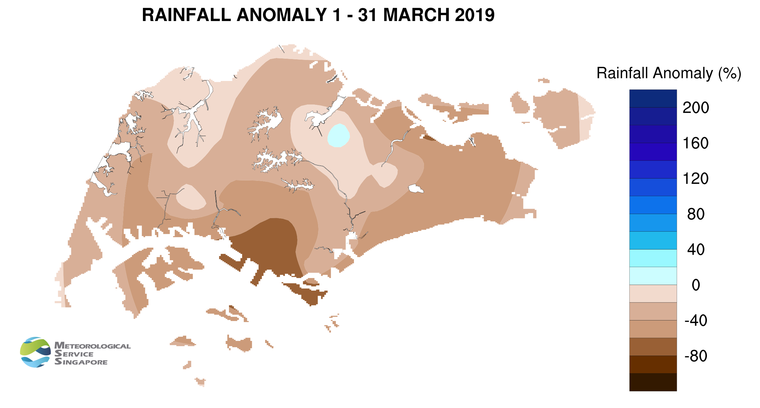 9 Many parts of Singapore received well below-normal rainfall in March 2019. The highest rainfall of 244.0 mm (15% above average) was recorded at Ang Mo Kio. Rainfall was lowest at Sentosa Island where 39.0 mm (80% below average) was recorded.